These first three months have flown by. Cambria has become an amazing little person. She is one of the funniest people I have ever met! Today she had her first six ounce bottle and ate the whole thing. That alone shows me that she is becoming such a big girl! Sleeping is still a huge issue for us. No matter what we do, she won't go in her crib. I have tried my absolute best and I am out of ideas. She will sleep on the couch, in her carseat, in the playpen, and anywhere else you can imagine except the crib! I am going to try to get her on a schedule, but that's very difficult when I, myself, don't have a set schedule. I have never been a "schedule" type person, but I will try for her. I haven't slept next to my husband in far too long! One sleeping trick we have discovered, though, is that she will sleep splendidly next to Xander. She likes the comfort of another body next to her and Xander sleeping next to her solves a lot of problems. We know that they won't roll onto each other and they sleep longer than ever. However, they don't sleep together, so we can't always do that. Wednesday she has her doctor's appointment and she will be getting her immunizations. I am not looking forward to the screaming and fussiness. She is a very sensitive baby so I imagine she won't enjoy these shots. Next month she has a cardiology appointment for them to make sure the hole in her heart is closing. She is playing quietly in her playpen right now, so I should probably go enjoy that! Cambria took her first plane trip on Dec. 25th, 2007. We flew from Akron/Canton to Atlanta for our layover. In Atlanta, we met up with Cody's granny and his aunt. From Atlanta, we flew to Dallas and we were there until yesterday. She did rather well flying except near the end of both flights. I imagine her ears must have been popping- I know mine were! Cambria got plenty of Christmas gifts and the majority of those gifts were clothes. I think buying her clothes eases any stress I may feel because I know that 3-6 months she's going to be clothed quite well! Today is New Year's Eve and my number one New Year's resolution is to get Cambria into her crib and out of our bed! Learn, as soon as you can, that you cannot depend on anyone but yourself. By the time you are grown and no longer need me, there will be a level of expectation that you should care for yourself and not search for a husband to do it for you. Spend your younger years preparing for the future as best you can. Enjoy the moment you are in, but always be looking ahead. Don't obsess over money, but never forget that you need it to survive. Be innovative. In your personal relationships, burn down the bridges that don't need to be there, but always keep at least one of them in working order. Enjoy the friends you have for the time you have them. Tell people you care about them- and mean it. Cambria has been doing this new, annoying thing in her sleep. She will fall asleep and I'll lay down with her and we'll sleep for a good chunk of time. But when she decides to wake up, she will lay there and wiggle around and make noise for a good hour before she finally really wakes up. On my smart mornings I get up with her as soon as the wiggling begins and feed her. Sometimes she'll fall back asleep and other times she won't. Christmas is coming up quickly and I didn't get everything I would've liked to for her. I did get a lot of clothes for her, but I couldn't find any toys worthy of my hard- earned cash. I bought all 3- 6 months clothes and she's still wearing newborn. So I don't know if she'll be able to wear them when we go to Texas for Christmas. I love Children's Place! Cambria has learned to love her swing! The past few days I've been able to put her in the swing and she has fallen asleep. Some times I miss holding her when she's in it, but I know I can get things done and I know this ability to sleep without being held is monumental so I leave her to it. I'm going to have to stock up on batteries though if she's going to continue to love her swing! She's even started reaching out for the toys on the front of it. I'm working two jobs now and I miss her so much while I'm gone. I understand why women become stay-at-home moms. Some days I think I would hate it and then on my days off I think it's blissful. If we had our own place, I might be able to enjoy the idea more. Oh well, it's not an option anyway so I won't even entertain the thought. I hope someday Cambria understands that all the work I'm doing now (the cause for my absence) is a necessary evil. I want her to have nice things and I have to keep her fed and clothed. Speaking of feeding. Breastfeeding has basically come to a halt. With two jobs and this recent sinus infection I have been too busy and too exhausted to pump. I get so antsy just sitting in the bathroom pumping, I can't stand it! I know it's worth it when it comes down to the money we'd save, but I don't have the time! My goal is to REALLY start pumping after the Christmas season is over. 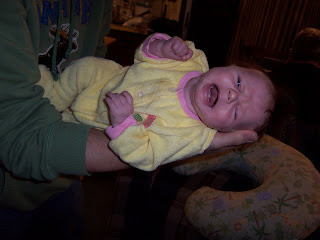 In the meantime I'm going to change my WIC coupons to formula *sigh*. Uh oh! The Jellybean is crying! For a handful of reasons, I will no longer be using this blog. Thank you all for your support and for taking an interest in our beautiful baby. Thank you for all the comments, I hope you have enjoyed this as much as I have. Xander. 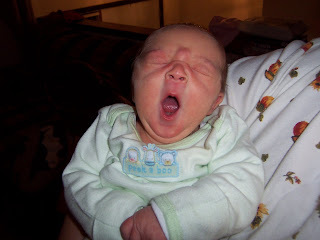 "I'm tiiiiired! Even though I just woke up." Cambria. "I'M GOING TO SCREAM IN AGONY FOR AS LONG AS POSSIBLE FOR NOOOOO REASON!" I survived a wicked fever and one awful night of aches, pains, shivering, and sweating. My mom was so kind as to care for Cambria through the night while I struggled through the night and half of the next day. Finally I woke up and the fever was gone and I felt better. I had my doctor's appointment today and everything has healed nicely and I can move on with my life. A quick examination did, however, show that I have thrush again. Needless to say I've been dealing with a lot of pain and suffering with this infection. Heather & Kendra came over for a visit and I laughed and enjoyed my time with them. Ryan & Lydia also came over with Xander and it was nice to see them since I hadn't seen them in awhile! Tomorrow they're coming into work for their pictures and hopefully the girls will let me sell to them. My cousin Melissa is getting married Saturday and the way things look it seems as though I won't be able to go to the wedding. My dad's mom is going to start chemotherapy Monday and Saturday was supposed to be the last time I would get to see her before that, but it looks like it won't happen. I knew when I took this job that I wouldn't have much freedom to request days off or anything, but it does get frustrating sometimes. Every time Melissa has anything going on (wedding, baby shower, birthday) I always have to work and I feel like I miss out on so much. I just hope it goes beautifully and I'll make an effort to see my grandma (and Melissa, Nathan & Noah) as soon as possible. My new hectic life tends to get very frustrating sometimes. I need to sleep so badly. I can't believe I'm still awake. I'm going to eat cheesecake and try to relax. I've learned not to get my hopes up about sleeping because it just doesn't happen too often. Everyday is a fight for survival.